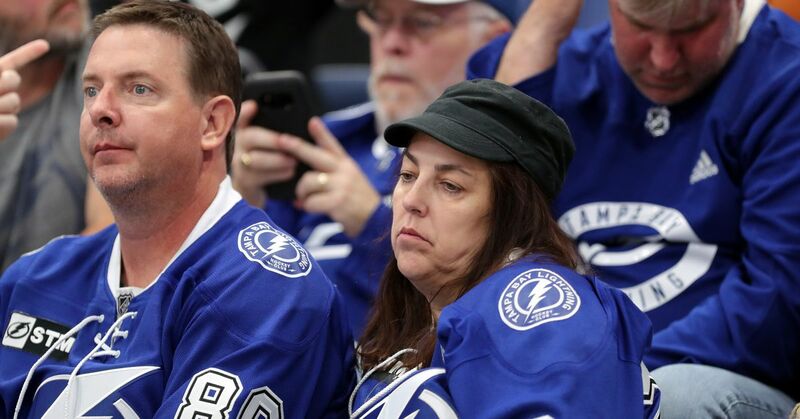 After his team was swept out of the first round of the Stanley Cup playoffs by the Columbus Blue Jackets on Tuesday, Tampa Bay Lightning head coach Jon Cooper said the Bolts' record-setting season played a role in their demise. "When you have the amount of points we had, it's a blessing and a curse, in a way. You don't play any meaningful hockey for a long time. Then all of a sudden, you have to ramp it up. It's not an excuse. It's reality. That's how it goes: You have a historic regular season, and we had a historic playoff." Tampa Bay fell 7-3 to Columbus on Tuesday after a regular season in which the Lightning tied the 1995-96 Detroit Red Wings for the most wins in a single campaign with 62. In addition to tying the wins record, Tampa Bay had the second-highest points percentage over an 82-game campaign in NHL history at .780 behind the 1995-96 Red Wings. Also, the Bolts' 128 points were the fourth-most in a season. On top of that, the Lightning had the best power play and penalty kill in the NHL, and their 3.89 goals per game were the most since the 1995-96 Red Wings. "I don't know. It's funny: We're expected to go far this year, and we go nowhere. In 2015, no one expected us to go anywhere, and we went far, with the same core of players. "It's hard to win in this league. It's tough not to be holding up the Stanley Cup at the end, but how many teams have gone through this? They knock at the door and knock at the door and then ... you look at Washington, for example. They had two remarkable years and got bounced in the second round, and the year no one expected them to do anything, they won the Stanley Cup." In three of the previous four seasons, Tampa Bay made it to at least the Eastern Conference Final, including a trip to the Stanley Cup Final in 2015. This year seemed like the Bolts' best chance to win a Stanley Cup since they accomplished the feat in 2004, but now they will be left to ponder what could have been. Despite the early exit, the Lightning are still built for success in 2019-20 and beyond. With forwards Steven Stamkos, Nikita Kucherov and Brayden Point (restricted free agent), defensemen Victor Hedman and Mikhail Sergachev and goalie Andrei Vasilevskiy all likely to be back next season, Tampa Bay will still be a Stanley Cup favorite, and it may have added motivation.